Although there are thousands of programs available to do digital scrapbooking, it's often difficult to find the time to look at all of them and learn all there is to know. Recently we had our third homestudy and I had to create an album; I needed to put something together relatively quickly so I ended up completing scrapbook pages using the collage feature in Picasa. You can view some of my pages in my previous post. 1. Initially you may want to select some "papers" and such online. 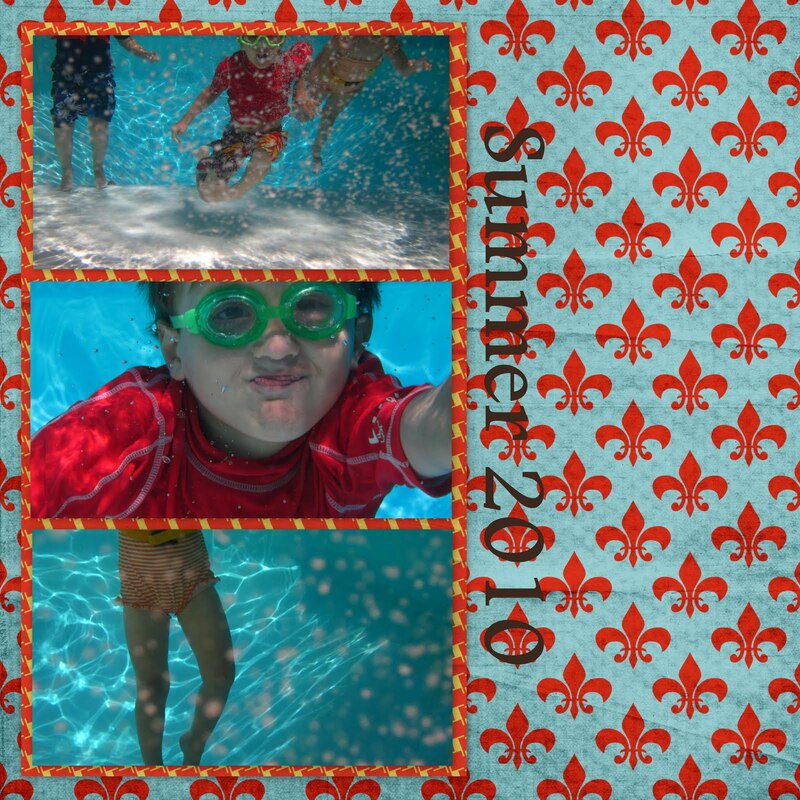 You could do a search for free digital scrapbook downloads. Some good sites for freebies are Two Peas in a Bucket, Designer Digitals, and Shabby Princess. Obviously, you could also purchase papers to use; many are very inexpensive and the beauty with digital is that you can reuse them over and over again. To me this step is the hardest part because there are many, many things to choose from and it can get overwhelming. 2. After downloading these files of scrapbook materials, you will then need to import them into Picasa as you do for all other images. 3. Next you can begin the process of creating your collage. Having an idea of what you'd like your layout to look like prior to beginning is helpful, but not necessary. You can always back track if the need arises. 4. You will begin by selecting the pictures and papers you'd like to use in your collage. Hold the ctrl key down as you select and you can put them into the collage all at the same time. The pictures do need to be in the same file to use the ctrl key. However, do not worry, there is another way to get pictures from multiple files onto the same collage. 5. You are then brought to your collage page. You will need to select the size for your collage. Although 12 x 12, 8 x 8, etc are not options, you can create a custom aspect ratio by scrolling all the way to the bottom after selecting Page Format. 6. Next you enlarge your selected image or paper to use as your background. You can also do this by selecting settings, going to background options and click on use image. 7. To select more images that are not currently shown in your clips folder, click get more and this will bring you back to all your Picasa files. Select the images you want to use and then click Back to collage at the bottom right of your screen. 8. Drag your images into your collage, arrange and resize. 10. If you'd like to use this image as part of another collage in order to overlap more than one paper or background, you can crop your image. 11. Next, save as a separate image so you can then use it as part of another collage. 12. You can then repeat the collage process again by selecting your images. Your previous collage is now an image that can be used when creating another collage. (I think I'm confusing myself by this point) In the snip below I selected my images for the collage and then chose one of the images as my background. Next you will have to delete the smaller image still visible on the top. 14. Next you can add text as you please. You are able to change the size, font, style, alignment and transparency of your text as well as rotate it however it best suits your page. And there you have it, merely a 14 step process. It may seem overwhelming at first, especially with my somewhat cryptic description. It really isn't all that bad. I learned by experimenting and some trial and error. There is definitely more than one way to do things and as you practice, you may find a way that works better for you. Hopefully, this will at least give you a push in the right direction. This is a basic page to start off, but you can make them as simple or elaborate as you'd like. I really appreciate the help...My husband asked me the other day if I was going to do a scrapbook for our second baby, when I pointed out to him that I have yet to actually finish the baby scrapbook for the 3 year old! I think doing this digitally will help me keep up with the albums better. You're welcome Jillian! I hope it helps. I can't wait to try this! I found your blog from the link at Clover Lane. I am behind on baby albums, so hopefully this will help speed up the process. I was wondering, where do you store all your photos? Do you store them on your personal computer with a backup or do you store them all on Picasa? Currently, I have all of mine on our computer and I back them up on an external hard drive. I'm just wondering though if it's easier to do this if you have them all on Picasa to begin with. Does that make sense? Thanks for your help! Picasa is actually a place where you can edit and catalog your photos...a way to organize them. They are still stored elsewhere, but viewed with Picasa. My photos are stored on my computer and backed up as well.